Harbin food is influenced by Russia, Korea, Mongolia, and of course North China cuisines, especially Shandong Cuisine. Dishes are usually fumigated, stewed, or pickled in sauce. They have a wide field of selecting materials, and are various in style. 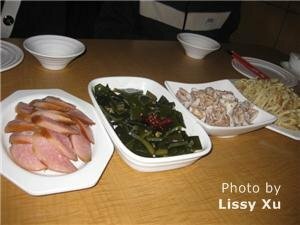 You will find that the dishes are saltier and served in a much larger amount than those in other cities in China. You will also find that the dishes have heavy use of vegetables, such as cucumber, cabbage, corn and potato, Shaokao (Chinese BBQ) and Hot Pot are equally popular. Dumplings are a must-taste in Harbin, featuring thin pastry shell and various stuffing. The following dishes are very common and popular in Harbin: shredded chicken fried with bean curd, shredded chicken stew with mushroom, stewed pig&apos;s elbow, vermicelli (bean or sweet potato noodles) stewed with fish, vermicelli stewed with pork, and pork bone seasoned with soy sauce. They are all delicious and sold at low prices. Tossed dishes (like salad) are also popular, and various materials are used, the most common are potato, green pepper, dried bean milk cream in tight rolls, and black fungus, and are usually dressed with soy sauce and aged vinegar. Due to the city’s history with Russian immigrants, there are some western restaurants and cafes in Harbin. Dalieba (or Khleb, a kind of Russian bread) and Hongchang (Harbin Smoked Red Sausage) are typically Russian, and they not only are the delicacies on local people’s table, but are also good gifts for friends and relatives. Khleb is a kind of Russian bread. It is big and round, as heavy as 2.5 kilograms (5.5lb). It tastes fragrant with hard shell but soft inside. The ingredients for this bread are flour, salt and hops. Khleb is convenient for carrying and storage. Hongchang (smoked red sausages) are made with lean meat. Because they are smoked with wood, there is a thin cover of charcoal dust over them. But do not think they are dirty, because it is with this dust that you can taste the true smoking flavor. When eating the Hongchang, you can also make a sandwich with the Khleb. They are sold in lots of bread and pastry stores in the city, especially Central Avenue. A famous brand is "Churin (秋林)", with chain stores almost everywhere to be found in Harbin. It is a traditional and famous dish of Harbin, especially popular in winter. You can find this dish in most restaurants. Chicken is shredded and stewed with mushroom, ginger, scallion and vermicelli (bean or sweet potato noodles). When the dish is ready, the chicken and mushroom taste soft, tender and smooth. It is nutritious and fragrant, and a perfect dish to warm you up in winter.